After almost four years of siege and bombardment, the opposition district of al-Wa’er in Syria’s 3rd largest city Homs has finally capitulated to the Assad regime. On Monday, the opposition dropped some of its demands — notably over the release of political detainees — and accepted the removal of rebels and their families. The first group of 1,500, including other civilians, will be part of the departure of about 15,000 from the estimated 50,000 people in the area. Q: Since negotiations first began in 2015, the Waer negotiating committee has said that under absolutely no circumstances would they back down from the condition stipulating the release of more than 7,000 detainees from across Homs province held by the regime. For the first time in two years, that condition has been dropped. What changed? There are both internal and external factors that caused people to drop a number of the conditions. Regarding the internal factors, the people of Waer have been under enormous pressure due to the encirclement and the bombing. There’s no food, there are no medical supplies. There’s nothing here. There are also external factors, such as the length of the revolution and the failure to reach any possible international solution. These factors led the people of Waer to drop some of their demands. Since negotiations first began in 2015, the Waer negotiating committee has said that under absolutely no circumstances would they back down from the condition stipulating the release of more than 7,000 detainees from across Homs province held by the regime. For the first time in two years, that condition has been dropped. What changed? When the people first came out in demand of freedom, they never imagined that they would have to pay in blood for years. They never imagined that so many countries would intervene and stand beside the regime as it kills its own people. Specifically with regard to the detainee release condition, yes, it’s been dropped. It didn’t make it into the final agreement, and the regime made clear that this would never be a condition. As the negotiating committee, we don’t want to lie to the people. There are neither negotiations nor a proposal on the table regarding the detainees. As unfortunate as it is to say, their fate remains unknown. Our thoughts stay with them out of fear for their safety and security. When we first met with the Russians, we brought up the matter of the detainees. We asked about the charges that they faced and said that they were arrested for participating in the revolution. The Russians answered that they were terrorists, and this condition was never brought up again. If there were two sides that were equal in strength, then you could call this surrender. But what you have here wasn’t equal, not in numbers and not in firepower. The revolution began solely for the purpose of freedom, nothing else. What the regime, however, has shown is that they are willing to use any means necessary to stamp out the revolution. From bombing to starvation, their oppression knows no bounds. There is no mercy. The revolution became a war. All the while, the world watched, never lifting a finger. The people of Waer have been beaten down so much, and now they feel the pressure to leave, or to return to the regime. But this is only because there truly is no other choice. Could you give us a sense of what negotiations looked like from the inside? What were the internal dynamics? What was the atmosphere? The tension was readily apparent in that room. As members of the negotiating committee, we held the fate of 50,000 people in our hands. Meanwhile, we were sitting across the table from criminals, people who have killed and displaced thousands, people who’ve got no conscience and can’t be taken at their word. So, yes, we felt a certain degree of oppression. We were negotiating the surrender of our land. There were so many things that they said to deliberately get under our skin. They told us we’re “returning to the bosom of the regime” and that “we’re the ones who ruined the country and haven’t even accomplished anything”. Whenever they spoke of fighters they used the word ‘terrorists”. We were absolutely at our wits’ end. How much of a role did the regime’s month-long bombing play in bringing the Waer negotiating committee to accept this agreement? The regime used every type of weapon imaginable in their most recent military campaign, which began on February 8. The bombing went on non-stop for an entire month, and that’s to say nothing of the encirclement, the fact that medicine ran out entirely and even the United Nations’ aid was stolen before it could make it to Waer. 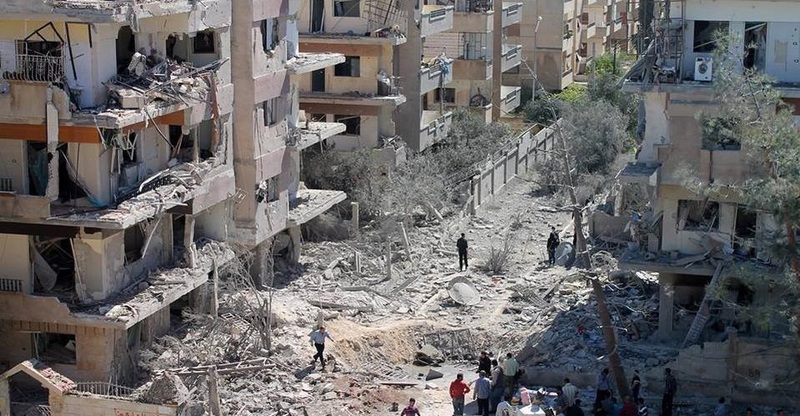 By continuously bombing Waer, the regime’s intentions were perfectly clear: If they can’t control the district through negotiations then they’ll impose their control by sheer force. In your opinion, was there any other choice — any alternative — to this agreement? We speak for the 50,000 people inside the district of Waer. Had the bombing and encirclement continued, there would have been a major loss of innocent life. We had two—and only two—choices in front of us: Either the bombing continues or we accept our forced displacement. And so we chose the latter in order to save the lives of innocent children and civilians. What are the terms of the evacuation per the agreement that the Waer negotiating committee signed on Monday? 1) The first group of fighters will leave seven days after the signing of the agreement. This group will comprise 1,500 people overall, including 400-500 fighters. 2) Evacuations of the same size will continue on a weekly basis until the completion of the agreement. 3) Syrian and Russian forces will bear all responsibility for the safety of those leaving the district. 4) Those leaving will be allowed to go to one of the following areas: Jarablus, Idlib or the north Homs countryside. 5) There will be a general committee formed comprised of representatives from the Waer People’s Committee, the Homs Security Committee, and the Russian side to oversee the implementation of the agreement and to address violations. A Russian military brigade, comprising 60-100 people, including Russian officers, will be present in Waer after the evacuation of fighters is completed. 10) To keep the National Defense Forces as well as Shiite and other militias from entering the district. Amount of time for completion of the agreement: Two months from the date of its signing. *Lieutenant General Igor Turchenyuk, the highest-ranking Russian officer in Syria and the head of the Hmeimam Air Base. He personally led the negotiations from the Russian side. *Colonel Sergei, the Russian military official directly in charge of the Waer issue. He is the one who is tasked by the Russian leadership with signing the agreement.